Your dashboard shows “all your stuff in one place”. 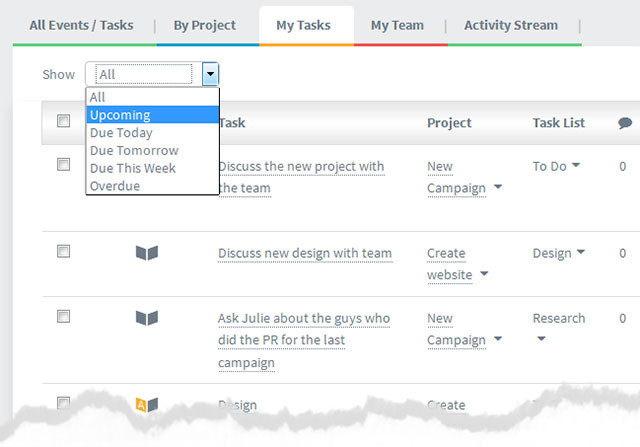 If there are several projects with various tasks assigned to you, each one is listed on your dashboard. Use filters to instantly sort your tasks into your preferred views. Plus, the many dashboard view options (detailed below) also give you control over which tasks you see – offering you better focus. You can “Drill down” into any task on your dashboard by clicking on it. This opens the task allowing you to edit it etc). There are various view options available to you on your dashboard. This helps you track what people are doing. It shows the latest actions by your team on any task you created or are assigned or are watching. Is useful for finding things you’ve done recently – for example you may want to change a task you created recently. Shows tasks assigned to you, tasks that you have created and tasks that you have assigned to others. Shows task assigned to others. 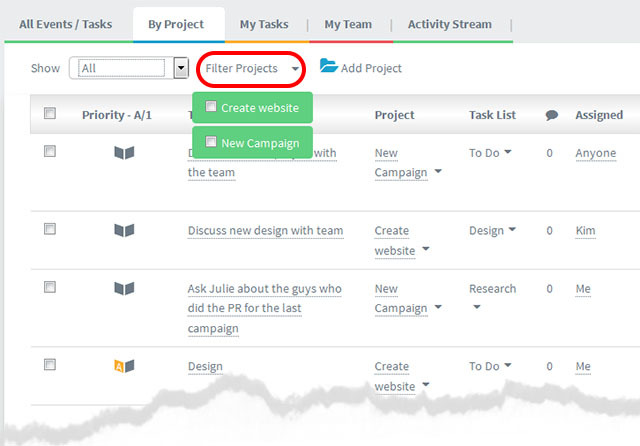 Use the Filter People link to set which Team Member’s tasks are displayed. (You can select more than one person at the same time). Shows tasks broken down by Project.